I never saw the Jim Carrey version of The Grinch. To be honest, I found the makeup work rather frightening for children, whom I figured were the target audience. There's no need to fear this newest version of Dr. Seuss' work. Therein may lie the problem, for The Grinch is probably the nicest Grinch the world has ever seen. 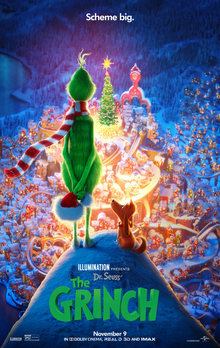 The Grinch follows the basic plot of Seuss' short story, but with some extra padding. Our titled character The Grinch (Benedict Cumberbatch) hates Christmas. Ostensibly via the Seussian-type narration of Pharrell Williams, it's because his heart is two sizes too small. The film strongly suggests it is because he was an orphan who not only had no Christmas celebrations but who associated the Yuletide with what he did not have: love. As a side note, this does seem to borrow from the Carrey version, at least according to my memory. Despite being far from Whoville, he still associates with it, having to go into town to buy supplies at the Who Foods. He thought he had enough to last him the Christmas season, but did far more 'emotional eating' than he first thought. Here, he literally has a run-in with Cindy-Lou Who (Cameron Seely), a precocious tyke who has made it her goal to see Santa Claus. It's not for selfish reasons, but to ask for help for her single mother Donna (Rashida Jones), who works at night and takes care of Cindy-Lou and her baby twin brothers during the day. Grinch also has to endure the excessive Christmas joy of his closest neighbor Mr. Bricklebaum (Kenan Thompson), who could be Santa Claus' twin save for his dyed beard. As Christmas comes closer, the Grinch finally hits on the brilliant idea of stealing everything from Whoville. Enlisting his long-suffering yet lovable dog Max, temporarily along with an overweight reindeer he names 'Fred', the Grinch plans, rehearses and sets his plans to work. In the end, he finds that the Whos in Whoville don't care about things, and he finds himself welcomed to the Whos Christmas dinner. When watching The Grinch, indeed when watching any movie, I have to keep the target audience in mind. Here, it is very small children. As such, I can offer it a mild recommendation only thanks to how bright and pretty it all looks. Animation-wise, The Grinch is quite pleasant. Again, literally 'thinking of the children', I figure they might be entertained. That being said, The Grinch itself has no reason for being apart from money. The original 1966 television special with Boris Karloff not only still holds up but covers everything that needs to be covered in its short running time. This version, while still clocking in at under an hour and a half, oddly felt longer. That might be due to the Cindy-Lou Who subplot of her efforts to catch Santa. We also get sight gags with Max and Fred. Now those are amusing: I did laugh when Fred attempted to make the Grinch's coffee...and Max's growls when the Grinch called it the best coffee he ever had. The problem with The Grinch is that he is not very Grinch-like. Like many films today, we have to have a sympathetic villain, or at least a psychological one. Rather than his heart being 'two sizes too small' as the probable reason for his hatred for Christmas (since no one really quite knows the reason), it is that he really is just a lonely man in need of love. We know this because in his lair, he plays All By Myself on his massive organ. He also apologizes to Max for chasing him away after not impressing him with Max's drumming and lets Fred go home to his family when he sees them. Is there something wrong with me not wanting the Grinch to be so cute and cuddly before his heart grows three sizes on Christmas Day? We do get some nice work from the actors, but I do wonder why directors Yarrow Cheney and Scott Mosier made the decisions they did with them. In particular, I look at Cumberbatch, an actor I greatly respect if not necessarily like. You would think with his impressive, rumbling baritone he could match vocally with Karloff, but they opted to have him speak with a tame American accent. Perhaps this was to make the Grinch less frightening than he could have been if Benny had rumbled through his words, but why Cumberbatch wasn't given the chance to shift to more malevolent tones I can only guess at. My guess: again, as this was for children, we have to have it be very safe. Jones and especially Seely were wonderful as Donna and Cindy-Lou, the latter having that adorable way with words that children have. Thompson and Angela Lansbury as the Mayor of Whoville could have been cut but they are quite pleasant in the film. I'm not convinced Williams was a good narrator because again he seems too pleasant to be telling us this semi-dark story. It also seems rather odd to have this mix of the original text with rhyming that comes close but not exactly like Seuss' work. Again, the colors are nice and bright and there are some really funny moments. For example, there was when the Grinch sends Max to case the town via a drone until Max ends up crashing into the Grinch, delightfully oblivious that Max is flying at him. "Oh look, there I am," the Grinch says right before Max collides into him. Overall though, I imagine The Grinch will entertain really small children who will like the bright colors, the funny characters and sight gags. I think for the rest of us, it might be mildly amusing but not something to see on repeat the way the Boris Karloff version will be. You're Not A Mean One, Mr. Grinch. It's up to you to decide if that is a good or bad thing.